What happened to all the sleet? Totally confused Is it only the Nam that showed all the sleet? Looks like the above is definitely in Play for NYC, maybe number 1? Now I'm reaching to far. Lets get the 3 inches first and get them over 30 for the 5th straight year. jimv45 wrote: Yea Hyde I am just north of 84 on the nam its well over a foot for me but close. Yup. 30 miles north of you gets 2-3 inches on 3k. I'd say somewhere between central Rockland to northern Dutchess will be in a serious cutoff zone. The question is where will that line be? Im about 58 miles south of Dutchess.....according to the 3K im in a prime spot, last 3 storms shafted me with two blanks even. I'd like to see 12 plus this go round along with Jman. 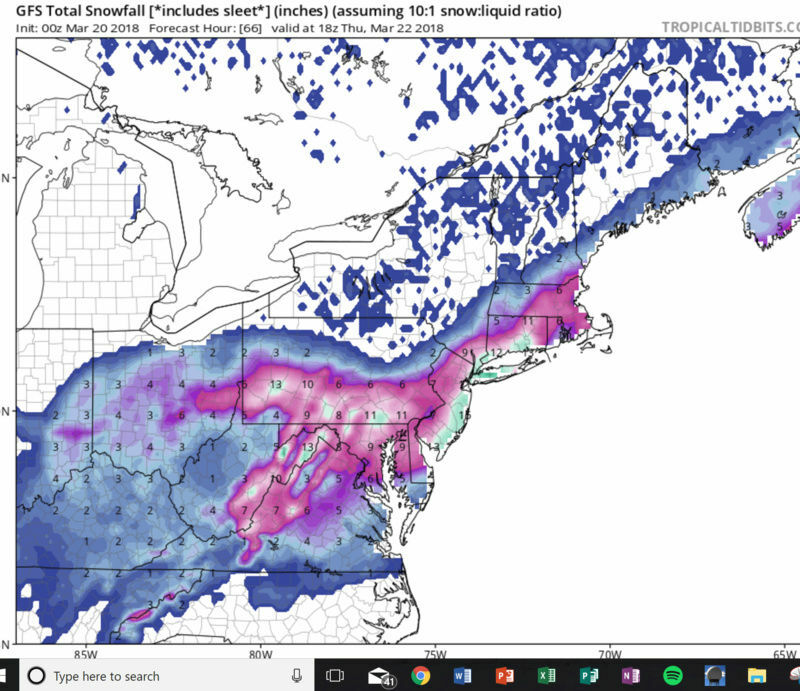 Lots of chatter on Twitter right now regarding how dangerous and distructive this storm might be (even @cranky seems alerted finally), with inches of sleet, centimeters of ice underneath 6 inches or so of heavy wet snow. Could be a doozy. Incidentally, my best friend is going thru a tornado right now down in ATL. March does NOT f*ck around. SoulSingMG wrote: Lots of chatter on Twitter right now regarding how dangerous and distractive this storm might be, with inches of sleet, centimeters of ice underneath 6 inches or so of heavy wet snow. Could be a doozy. yeah may be worst cause for power outages out of all the storms we have had. 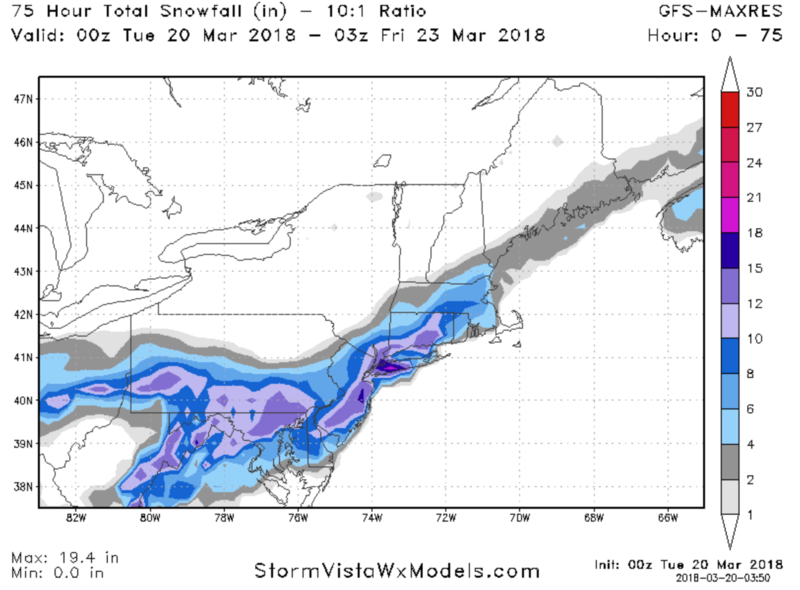 Gfs huge hit NYC southern wc and western long is jackpot 12 to 18. So who thinks there will be school wed and Thurs? For NYC area? beautiful and I checked precip types on wxbell no rain no frz and a tiny bit sleet that's all heavy snow baby! And that's the GFS how good has this model been of late? 00z UKIE just (N)UKIE'D us. 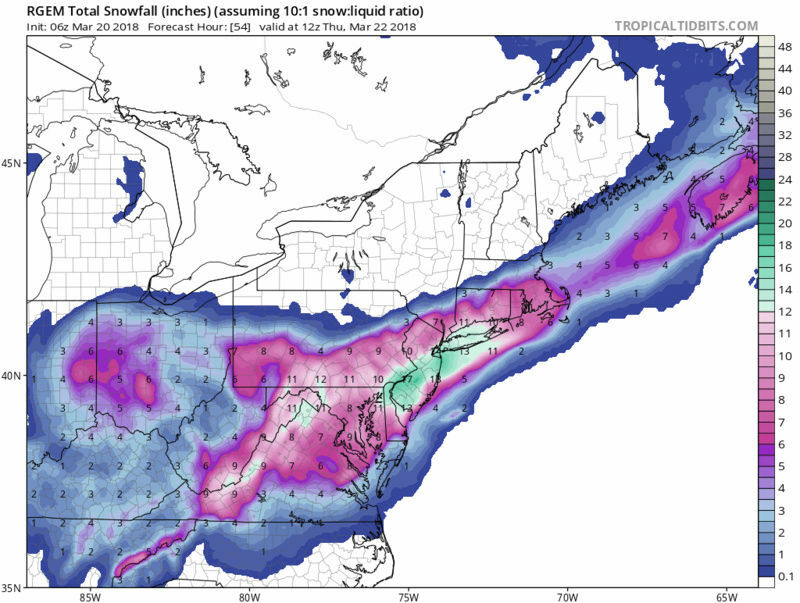 I’m 18” jackpot on GFS, RGEM, 3kNAM, but on regular NAM 4-6” and tons of sleet. If EURO shows me tons of snow that’s 4 v 1. Toss the regular NAM. Oh I’m also 18-24” jackpot on the RAP. This is what Upton has for me. NWS has Orange County for 10-16 inches but I'm not buying it 100% yet. The 6Z NAM has me concerned as do other runs that seem to hit a brick wall with the precip at certain points north and west. Nowcast as usual.